Sometimes heat is a great therapy of choice. Other times, it may be better to use cold therapy. When you describe your back pain, what words come to mind? Words like sharp, shooting, stabbing, recent, inflamed, or swollen, then those are “hot” pain words and you would likely benefit from applying cold temperature onto the area. 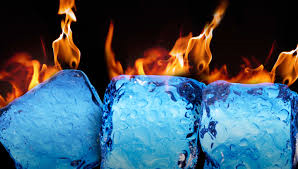 Contrastingly, words like chronic, achy, sore and stiff are “cold” words and you would likely benefit from applying hot temperature onto the area. As a general guideline, I recommend patients apply temperature therapy for up to 15 minutes per hour. Overall, that allows enough time to let the tissues respond, while still not getting too much of a good thing. I never want patients to take anyone’s recommendations “just because I say so”. Think for yourself. Your body is smarter than you might think. It’s also not like anyone else’s body, so pay attention to it. If it’s saying “I need more heat/ice” or “ok, that’s just about enough of that”…listen. If you are confused about what signals your body is sending you, or if you want some more clarification on where to start, call us at 317-598-5221. As schedule permits, I would be happy to have a conversation with you to help clarify matters.